Our Thingsmith interviews spotlight the designer/makers that are playing an important role in the 3D printing revolution. In this series we hope to explore what motivates and inspires some of our favorite Thingsmiths. 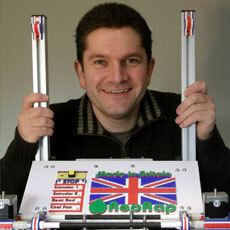 Richard Horne (RichRap) has established himself as a stalwart of the RepRap community. He is well-known on Thingiverse for his fantastic experimental prints and willingness to take on big printing challenges. An expert in the art of multi-coloured printing, Richard has produced some iconic pieces including the fantastic striped Stegosaurus – sliced. Richard continues to push the boundaries of 3D printing with his most recent experiments into edible prints and ceramics. 1. Tell us about the creation you are most proud of and what inspired it? My simple filament joiner and layer selective coloured printing. I was clearing out some old things from my childhood and found my old scraperfoils. I really loved these, you carve away the black surface guidelines to expose a chalk image giving you a picture and a somewhat rudimentary textured 3D effect. I then used pen inks on the chalk to make my birds, lions etc. come to life with colour. When I found these old images, I made a link with the plain coloured 3D prints I had seen and thought about adding colour using layers to make them more interesting, I then had to spend 6 months building my RepStrap before I could try it out. 2. When you embark on a new project, what’s your approach and what are your favorite tools? I tend to evolve ideas and designs as I work on them; I’m not a fan of planning and designing everything before starting something practical, I like to see what influences me and experiment. I’m also a big fan of simple paper pads – I make so many notes and sketches and have lots of them for all sorts of jobs and projects, from home DIY to 3D printing, and more recently my love of blogging continues to compliment my note pads that I use every day. And of course my very favorite tool is now my 3D printer! 3. There’s an amazing community of makers out there; who’s work has recently impressed you? MendelMax caught my eye recently as a great machine evolution and I’m always impressed by sculpture and organic models, but what really impresses me the most, is the many wonderfully talented people out there doing amazing designs and projects together. One person I really want to thank is Chris Palmer (AKA - Nophead) if it was not for his blog and his ongoing amazing journey I may not have taken the plunge into RepRap. From the very first entry on his blog I was hooked and also felt exactly the same way as I imagine he must have - “ My friend Wes pointed me to www.reprap.org and I immediately decided it was what I was going to do with part two of my life”. I’m always delighted to see so many new people every day on the forum and Thingiverse doing amazing things and getting involved, improving and building on this technology so everyone can benefit. 4. Gazing into the future, what’s the next amazing project we should look out for? Other than a real life star trek replicator I’m fascinated with both the extremely small and very large-scale 3D printing fabrication – from the ultra-fine microscopic layers and extreme high resolution to the really massive, complex impossible looking printed sculptures, houses, bridges etc. it’s going to be amazing watching all this unfold. I would love to be even more involved. I’m looking into food printing at the moment and it will need some community help to make it amazing, it’s much harder than I thought! 5. At Faberdashery Towers we are fuelled by Tea, Earl Grey, Hot. What’s your tinkering tipple of choice? Normally Vanilla Green Tea and maybe a festive Gingerbread latte or two. 6. Just one last question. As an expert in multicoloured printing we thought it only right to ask what would be your ‘limited edition’ filament colour? Oh that’s really easy – a complete set of chocolate coloured filaments from creamy white chocolate to 100% Cocoa, it’s my one weakness.